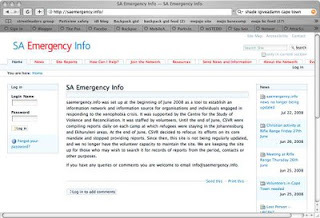 Some people have been asking about the saemergency.info project so I thought I would write a short account of how it came about, what it was and how it worked… saememergency.info was an online tool to help organisations and individuals who responded to the crisis of xenophobic attacks that occurred in May 2008. It is a partial and personal view. I was one of the people involved and I had a far from complete picture of events as they unfolded. A mob attacks a group of immigrants in Alexandra township in Johannesburg. Two people are killed. Violence breaks out in Diepsloot, another township in the West of Johannesburg. attacks on foreigners spread to other areas. One immigrant is burned to death. Over these few days, tens of thousands of foreigners living in South Africa flee their homes for police stations, churches and other refuges. Estimates vary but somewhere around 50,000 people are now being housed in temporary shelters, mostly in Guateng and the Western Cape. Government is slow to respond. But civil society is not. Church and other religious groups, concerned individuals, community based organisations (CBOs) and NGOs respond collecting supplies, providing food, shelter, medical and other services. There is a surge of public participation in church-led and NGO activity to support those affected by the crisis on a scale possibly not known in South Africa since the early 1990s. Human Rights Commission (a state institution, independent of Government, established under Chapter 9 of the SA Constitution convenes a meeting of all ‘Chapter 9’ institutions (including, for example, Gender Commission, Youth Commission) and a fairly wide group of NGOs to discuss response to the crisis. The Centre for the Study of Violence and Reconciliation (CSVR) is mandated to co-ordinate information for ‘civil society’ (ie non-governmental organisations). Sometime before May 24th some people adapt the Ushahidi engine to start a site unitedforafrica mapping attacks. At this stage most of the camps are still being run almost entirely on volunteer services, though the governmental disaster management service teams are present. Co-ordination is difficult. A very small number of people carry the burden of being information points. The mobile telephone is the main means of communication. Also some of the key people are now getting exhausted. A few of the volunteers at one of the camps in Johannesburg (Jeppe Street police station) identify a need for much better communication platform to allow better co-ordination between the myriad of organisations (formal and informal) that are working on the emergency. We phone around of about 20 of the organisations working to support the response to the crisis – church groups (Methodists and Anglicans very active in efforts in the Joburg camps), Gift of the Givers (muslim charity that provided very effective relief at a number of the camps), CSVR, and others. All agree there is a real need for a central information source to aid collaboration and co-ordination of voluntary efforts. A voluntary network established of a group of media professionals (mostly journalists), a web content company, a web development company and CSVR. We draft a very high level plan to create a web-based information platform to improve co-ordination. Start compiling contact lists of organisations to inform and also assemble team of volunteers. Gauteng Provincial Government makes “declaration of disaster”. Government, with support of international agencies begin moving people from informal camps in Gauteng into new larger camps run by the province. UN estimates there are 7,382 displaced people in informal and new camps in Gauteng,19,486 people in Western Cape and 1,814 people in KwaZulu Natal. saemergency.info domain registered, email and site hosting established. We build the site using plone open source platform. A basecamp account for all the volunteers and organisations to collaborate, message and share documents on is set up. Later that week the site saemergency.info goes live. very detailed site reports on each camp in the Johannesburg and Ekuruleni areas are published. The reports are being compiled by CSVR. Site is not covering Western Cape. Attempts made to network better with Cape based groups (many of whom have been co-ordinating efforts via Treatment Action Campaign offices in Cape Town). We establish a roster of volunteer editors so that there is an editor each day to process and post information onto the site. The skill set we have in strength is journalistic (being able to identify the reliability of sources, verifying information, identifying useful information). None of us working on the project daily have strong technical skills. This creates challenges. We try to train CSVR staff, for example, to use the content management system (cms) to upload their reports directly, but this takes weeks rather than days. Time is also a challenge. Information comes in, generally, via email. It then takes hours, and sometimes a day, to get it up on the site. The site soon has an extensive amount of information on it. Detailed reports on each refugee site which describe what is happening, what resources are needed, whether basic needs are being met. It also has a lot of useful resources (access to services to find lost people for example). We struggle to build a strong database backend that would allow people to efficiently search for contacts and this may be one of the site’s major weaknesses. The site stays active through June. At the beginning of the project we have established resources (all unpaid and voluntary) to run the site through to mid July. We are aiming to find an institutional home for it to maintain it after that. At the end of June the CSVR decide that they need to withdraw from the role they have been playing (since the HRC meeting on the 19th) and focus on their core work: re-integration and the provision of counselling services to those affected. Over this time the nature of the camps changes radically. The vast majority of refugees are now in Government controlled camps. Government disaster management structures have their own communication systems and we are much more ‘plugged in’ to the NGO sector than the government sector (though a number of managers in the government sector tell us they would like our help which we try to provide.) The role of the NGO and volunteer sectors is reduced and, in some cases, resisted by the state structures that now manage the camps. The site is closed in July. As of the time of writing (October) , though almost all the camps in Gauteng have been closed, there are still camps operating in the Western Cape. Significant numbers of refugees have left the country. Others returned to where they lived previously or to other places in South Africa. Others remain at sites that have officially 'closed'. Though the SA government promised (and claims it has been carrying out) a well planned 're-integration' programme, it is not at all clear to what extent this has happened. Certainly the crisis is not over. What role did saemergency and other online initiatives play in the response to the ‘xenophobia crisis? Saemergency.info was one of very many ‘civil society’ initiatives that sprung up spontaneously in response to the anti-foreigner violence in South Africa. It was created in response to an identified need – essentially to provide timeous information that could be shared between a variety of formal and informal institutions to improve the co-ordination of the responses to the refugee crisis that arose following the attacks. In the section below I have tried to give an overview of the various means that organisations involved in the humanitarian response used to communicate. After that, I've set out some of the learnings that we may be able to draw from the initiatives that were undertaken so we might be able to do better next time. Voice-calls and phone-based networks were the main means by which spontaneous networks emerged and communicated. One of the strengths of mobile based communications in SA is that almost everyone has a phone (there are more mobile phone accounts than there are adults). And its usually with them 24/7 wherever they are. Another strength is that you know your message has been received when you sent it. However this form of communication has some significant limitations. First, a few people ended up as network nodes and soon got overloaded. A case in point was the leader of the Methodist mission in central Johannesburg. His cellphone number was published in a major newspaper as the contact point for donations at a point when the mission was one of the major refuges in the city. He received hundreds of calls daily from people wishing to help. Second, there’s a limit on the quantity of information you can get into a phone call! Thirdly, it’s a poor method of publishing information a lot of people need to receive. Fourth, the network itself is invisible and inaccessible except via the individuals you know. You need to know people’s numbers! Telephone directories today are no longer effective tools (and there are no telephone directories for mobile phones in SA). Lastly its push, not pull. When someone wants information, they need to make a call, and they may not know the right person to call. This, combined with the previous point, was something many people experienced in the first weeks of the crisis, finding the right person to talk to, and then actually getting hold of them was difficult and time-consuming and resulted in a lot of inefficiencies. Email was heavily used in the crisis. Many or most people and organisations involved in responding to the crisis made use of email. The dominant method of publishing announcements and data was via email lists. CSVR, until the saemergency.info site was live, used email as their primary means of distributing their reports to over 100 recipients. The network based at TAC (Treatment Action Campaign) in Cape Town had a list of over 300 recipients. At the time of writing, this list is still active. Email is fast, cheap, and widely used. It works! Also the fact it is asynchronous helps avoid some of the overload problems associated with the phone. However, it also had significant drawbacks. First, it worked best as a one to many network. As many to many it was clumsy. If everyone on the lists started responding via ‘reply all’ to everyone else on the list it soon become overloaded. Second, for many if not most of the people on the lists, it was only accessible once a day. At the camps themselves, most of the people who needed information were not online until they got home or back to the office – often at midnight. Very few people had or have email access via their phone. Thirdly, the information sent via email wasn’t sorted, filtered, indexed or searchable. It was time-consuming to wade through your inbox and find what information you needed – most information was in the form of attachments – and, as importantly, it was not always easy to find what communications you needed to respond to. The last problem was the recipient lists themselves. Updating, verifying and extending them across the network was a very hit and miss affair. From my knowledge, no-one was really able to spend much time working on this so who was on the list or not on the list relied on a very few individuals and prior relationships. This was problematic in a situation when so much of the work was being done by groups that had not previously worked together and some of whom had spontaneously arisen in response to the crisis. My first observation on the web is that, to my knowledge, it was used very little as a practical tool by those most involved in responding to the crisis. A search of google groups for example found only one group set up explicitly in response to the attacks (it only had three members). The largest quantity of information available online about the attacks, the subsequent refugee crisis and the response to the crisis was through the sites of the major media organisations in South Africa (for example www.thetimes.co.za www.sabcnews.com www.news24.com ). Saemergency.info was one of three web-based initiatives I know of set up specifically in response the crisis. The other two were unitedforafrica.co.za and a closed members only site run by a an organisation called igiveadamn - a charitable social networking site and Shade , a church-based NGO supporting displaced people. This site maintained a very detailed daily needs database for a number of the camps in the western cape. UnitedforAfrica was focused on documenting attacks and mapping them using googlemaps using the ushahidi engine that had been developed by an international group of African and US developers during the post election violence in Kenya. The shade/igiveada.mn site was a private invitation only network with a powerful database backend that tracked resources provided and required at a limited number of displaced persons locations in the Cape region. It was used by a closed group of organisations that worked at the locations that the site tracked. The saemergency.info site was open (though to comment you needed to register) and was aimed to be an information exchange for organisations active in responding to the crisis. Its interesting to compare the purposes and strengths and weaknesses of the three (based on my very limited knowledge of the other two sites). In the context of the specifics of the South African crisis, it turned out that disseminating information on attacks may not have been the greatest need (compared say to the post-election situation in Kenya), at least according to the people we consulted as we set up saemergency.info. This may be because the attacks themselves took place over a relatively short period. It was also true that SA mass media had a lot of resources applied to covering incidents based largely on information from police as well as phone-ins to radio stations when attacks took place. The other challenge of the unitedforafrica model was that, as a ‘crowdsourcing’ project, it required crowds to know of its existence in order to get to a critical mass of informants. The mapping approach could have been very useful if it had been extended to mapping the situations daily at the camps. If, for example, the information that was being collated at saemergency.info and by the igiveadamn/shade teams had been mapped this could have been useful. Two other questions arise for me in reviewing the site – is a map always the most useful form of representation, or organisation of information? This may depend on who is using the information, for what purpose and when? By and large the users of saemergency.info and the igiveadamn site were well aware of where the refugees were, and wanted timeous information on what was happening in the locations that they were capable of supporting. So they didn’t really need a map. There were significant differences in approach between the igiveadamn and saemergency.info sites in how they gathered and organised information. Saemergency.info gathered information in three ways. Firstly, it published very detailed reports compiled by CSVR (see above) these were compiled by professional researchers who conducted visits to refugee camps and completed detailed questionnaires. Secondly the site editors collected information from a wide range of organisations many of whom included info@saemergency.info on their email address lists. Lastly, registered users could post information directly to the site. From my limited knowledge of the igiveadam site I understand the users of the site provided information to the webmasters via email or phone predominantly and the webmaster then updated the database. The igiveadamn site had a sophisticated database backend which meant information was highly structured and could be searched in sophisticated ways. Saemergency.info published reports but never compiled the contents into any form of database. If you needed the latest available information on a particular camp and say the medical situation there, you could find the report and then search it. But if you wanted to know the medical services situation in all the camps you would have to open each report and search separately. Also the majority of information was posted as documents for downloading. As webmasters we were amateurs and didn’t always know how best to organise the site to make the information as accessible as possible. The igiveadamn site was largely for the use of a well-defined group of volunteer organisations that were supporting refugees in a defined number of camps. In other words it was an effective on-line tool for the use of a well-defined off-line network. Both saemergency.info and unitedforafrica aimed to utilise the power of online social networking to aid making NEW connections between users. But this was a substantial challenge. First, even though South Africa is one of the most connected countries in the continent, the number of people online is still very low by developed country standards of comparison (in 2005 11% of population used the internet according to UNDP). From accounts I have read on Ushahidi’s use in Kenya, it was able to rely on an active small group of bloggers (some of whom may have previously been part of some network – at least to the extent of reading each other’s online communications) to achieve its purpose. In our case, our objective was to network a wide range of disparate organisations and individuals, only some of whom were in touch with some others. These people were often members of small organisations with some, though limited, resources. A typical example would be a local church group that found itself close to one of the camps and became involved in regularly supplying help from food to pre-school teaching. The tools they were familiar with were the mobile phone and email. They were not normally users of online social networking or collaboration tools. We were aiming to create a common benefit of the network effect for users of the site. The threat to our project was that without sufficient participants we were subject to the negative impact of the network effect – if the network is small its value to a current or new participant is low. From google analytics data, it appears that most visitors to our site came directly, probably from emails sent out on a number of email lists, and the vast majority of visitors came from the Johannesburg area reflecting both the fact that we had much better (offline) networks in this area (than in the cape or kwa-zulu natal) and also that the information on the site was largely, though not exclusively, from the Johannesburg and surrounding areas. In the online world many of the tools to grow the network of users and thereby gain by the network effect are based on the assumption that people are already online. But what if they are not? Then you need to rely on other more conventional marketing tools (word of mouth, mass media, advertising etc). Another way that NGOs and other civil society organisations use is by creating memberships. Of these methods, only word of mouth was used. And we had very little time or resources (certainly no cash) available to work on any of these methods. So while the site represented a significant step forward from pure email-based networks in many respects, its network power probably didn’t extend far beyond those who were already on email networks. During the crisis and now, I strongly believe that establishing well-functioning accessible networks that exploit the available and appropriate digital technologies to hand is the most important challenge to focus on (ahead of working out what should be available on those networks). The content and information needs of the users in a crisis change all the time, but if the right people are connected, they will be able to exchange and create the information they need, as they need it. This has profound consequences. ‘Crowdsourcing’ works, but to get the ‘crowds’, in many of the contexts of use we are dealing with, they need to be located offline first. Also we may need some people who can be assembled online to take responsibility for extending the network into the offline space. Much of this work could be prepared for in advance – creating mailing lists, and creating communities of practice that already communicate online in preparation for emergencies to come. Its reasonable to believe that Jakob Neilsen’s “90 - 9 -1 rule” applies to social action networks as much as any other. And to invert Neilsen’s conclusions, in fact this is good news in terms of content creation. You only need 1% of users to contribute most of the information required to make the network useful to the other 99%. The greatest challenge is in getting to the right 99%, especially if you cant use the web to reach them (because they are not on it, or not regularly enough). So assembling databases of contacts, especially contacts who may be act as the nodal points in future crises, could be a very useful piece of preparation. So could preparing marketing and publicity plans. In South Africa, and possibly in many other African countries, mobile networks have become accessible to many millions of people. Access is cheap compared to the cost of internet access. If we want to reach a broad cross section of people on the networks we want to create (eg rural/urban, young/old, poor/middle class) mobile networks are the only ones that are capable of meeting the need. In South Africa we can reach millions not only via gsm but also via gprs. So we can consider using not only voice and sms (text) but also low bandwidth data-based services (mixit the social networking platform networks over 4m (young) people in South Africa). But browser-based mobile internet services may be accessible to only a small minority of phone users for the next few years and maybe considerably longer due to the high cost of handsets and the high cost of bandwidth. One lesson we learnt was that setting up short codes, negotiating discounted or free rates from telcos took time (much longer than it takes to establish a website). This is work that would benefit from preparation in advance. More important, there are exciting developments in creating tools for mobile (see mobileactive for a range of examples) but using them also need preparation – some require downloads of apps onto the phone for example. In reviewing some of the tools now existing and in development, (see for example, InSTEDD or USHAHIDI) its important to acknowledge that every situation is different and most importantly user needs are different. There are many kinds of active participants (international agency staff, national disaster management professionals, volunteers -organised and individual, those affected -organised and individual.). Working out what tools are appropriate means being able to be clear on these issues. We may need a lot more thinking on this. Its interesting how wide a range of issues arise around trust, and sharing information (including identify of users) when trying to utilise the power of online social networking for networks that include action and that need to have life some beyond the digital domain. Speaking to some of the creators of Ushahidi, one of the most important issues for them in Kenya was protecting the identity of the source. There are many places in the world and many occasions when this is vital. However in our situation, where we weren’t just trying to collect information but were trying to connect nodes of activity, it was essential that people knew who each other were. The interesting opportunity with many internet based tools is that it is possible to be very nuanced about just how public and just how private a piece of information is. But it requires careful thought to design or adapt the tools appropriately for the situation. For example, a key requirement of many of the individuals and organisations that used and wanted to use saemergency.info was being able to identify other groups and individuals who had resources that could be useful at camps they were working in. A senior disaster management centre manager, for example, one day wanted to find trauma counselling resources. On another occasion, someone working in one of the spontaneously formed refugee organisations wanted to find out who could help with tracing missing relatives. This required having members of the network identified and a significant amount of information about them held and searchable by other members. We never got to the point where this information was well organised on the site. But we also had pressure from organisations to limit access to the very same information, not for reasons of security but because of communication overload. As one manager who was involved in information gathering and trauma counselling said to me, ‘I’m tired of getting calls on my cell (mobile phone) from people offering blankets.’ And she was right, she was working 18 hours a day, she needed to focus on the important work she was doing, so making her information public was not necessarily helpful. One approach that I think could have worked very well would have been to try to establish online communities of practice – in other words connect people specifically by the kinds of work they were doing. These were often the people who wanted to share with each other. Following this approach, we might also have been able to distinguish the ‘9’ and ‘1’’ from the ‘90’ - in other words identify those who were willing and able to act as communication nodes to pass on and share to others as appropriate. Although we spent only one to two days researching the need, it was a very important aspect of what we achieved with saemergency.info. Prior to that we had thought of a number of other issues we might focus on: fundraising and advocacy among them. As we develop more tools to help in emergencies, we need to be careful to stay focused on actual needs (rather than interesting features). And we need to aknowledge that the specific contribution that online tools may best make will vary from crisis to crisis and from ‘community of need’ to ‘community of need’. One of the best ways to explain the differences in approaches between the different web based initiatives that developed in SA and also between, for example the work of INSTEDD, USHAHIDI and saemergency.info is to think about who these different initiatives were for. three wishes for the development of online tools in crisis response. This means focusing on apps that work with mobile phones with limited or no internet access. In SA case, for input purposes this could include assuming GPRS data services and apps. For output purposes needs to be accessible via text messaging and IVR. The politics of crisis response can’t be ignored in understanding the history of the tools we have and the forces dictating the tools we may be getting. Powerful state and international institutions (the network of UN agencies, international donors, international NGOs and professional disaster management teams) involved in emergencies (whether refuges crises, natural disasters or any other) are very information focused. In order to make decisions (and more importantly get decision makers far from the ground to make decisions) they want data and lots of it. But small NGOs and spontaneous formations that self -organise already have lots of information concerning the situations they are engaged with. Their need (as I experienced it) was to be able to communicate with others who were in a position to respond swiftly to that information. And its this ground up ‘organisation without organisations’ (as Clay Shirky describes them -thanks Eric) where networks can add the most value and make the most impact. There are great network collaboration tools already available (for free) on the net (eg google groups and google sites as well as open source equivalents) that could meet these needs if everyone were online. But we need ways of connecting these tools to mobile devices, or finding similar ones that can work with mobile devices. Lets spend as much time tryng to connect the networks of potential users as we spend on developing the tools. That way we might actually design the tools they need and ensure they are ready and able to use them. And finally, I’m not sure I would have completed this account without the inspiration of Eric Hersman and Juliana rotich of Ushahidi, Robert Kirkpatrick of Instedd and Patrick Meier of the Harvard Humanitarian Initiative, all participants and presenters at mobileactive ’08.